Digital Extremes continues to lead the charge in driving AAA quality into the Free-to-Play market today with the release of a massive new update for its hit sci-fi action game, Warframe®. 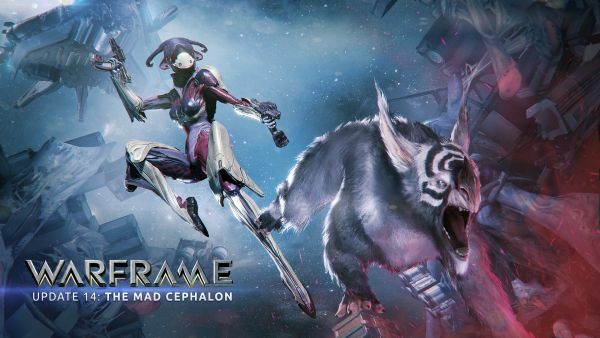 The new PC update titled – Update 14: The Mad Cephalon focuses on simplifying the new user experience and immersing the player further into the universe of Warframe. This includes a completely redesigned user-interface introducing players to their new player ship, The Liset; an exciting new Quest system starting with Vor’s Prize; arrival of the highly anticipated pet companions, The Kubrow; and, the unveiling of a new Warframe – Mirage, the master of illusion; plus, so much more. The community-driven interactive approach to development has paid off for the team as Warframe has just reached 10 million registered users worldwide on PC and PS4™ in just over a year into its Open Beta. The Kickstarter-style development and community passion for the game has helped it become the most downloaded game on the PlayStation®4 computer entertainment system and will release on Xbox One later this summer. NEW PLAYER EXPERIENCE – Immerse yourself into the re-imagined user interface and menus aboard your personal spacecraft, The Liset. A meaningful Quest walks new players through Warframe, providing essential information on gameplay, lore, game modes and menus and introduces players to Ordis, the ship’s Cephalon, a guiding voice on The Liset. PET COMPANIONS – A new Quest unlocks a Genetic Foundry used for breeding biological specimens on your ship! Breed a Kubrow by collecting a Kubrow egg and incubating it in the Genetic Foundry. Different Kubrow personality types have different combat and non-combat abilities. Make your Kubrow more combat effective by caring for it and equipping powerful link mods. Create genetic imprints of your Kubrow that you can trade with fellow Tenno and combine to create your perfect pet! NEW WARFRAME – A master of illusion, Mirage confounds the enemy in a spectacle of style and power. MIRAGE’s powers include traps, clones and more. QUESTS – Explore re-playable Quests with unlockable difficulty selection. This new Warframe experience opens with the debut Quest, Vor’s Prize. NEW DARK SECTORS CONFLICTS – Introducing a new player-versus-player game mode to replace the existing Dark Sectors Solar Rails conflict game mode. Choose which Clan or Alliance you wish to support and play the role of Attacker or Defender on a multi-staged objective mission! Up to four human players per side, with empty player slots auto-filled by Spectres. Trion Worlds fantasy MMO RIFT has just launched their first "RIFT Prime Server", named Vigil.